Happy Wednesday! I spent the holidays in San Diego with family and enjoyed good food, play time with the niece and nephew, endless sunshine and 70-degree weather. Not bad, right? Your necklace and bag are beautiful! The skirt is amazing and love the pop of orange with the necklace and bag! That leather skirt is amazing in a classic pencil shape! I love it paired with the pops of tangerine (which is going to be the next “IT” colour for spring 2012). Looks fantastic and very polished! My eye are drawn to that pencil skirt. What a beauty! so chic, as usual – and that necklace is rockin! I LOVE this outfit!!! that skirt is fierce girlfriend! I love this outfit! That necklace is fabulous! I love the color of this bag. It is such a new classic! Wow, I love this outfit. That leather skirt is fierce!!! This is fabulous! I love that skirt and necklace! Hope you had a great holiday in San Diego! Beautiful blouse. Nice skirt. And that necklace is too hot. This whole look is perfect, love the colors and the bag is just beautiful! This outfit is gorgeous! Especially the necklace! I really like the burst of color from the bag and necklace! This looks so chic and ladylike….love!! great skirt!! it looks amazing on you! Anh, I love the necklace and your new Stella skirt!!! Definitely going to check out Modewalk you’ve featured some gorgeous items! Love that leather pencil skirt! I’ve had a black pencil skirt on my wish list for awhile now – I’m thinking I might need to upgrade it to this one! Love this outfit!!! I love the statement necklace! I just stumbled upon your blog and I’m so happy I did. I’m following you from now on! Great style, like the colour and shape comb. LOVE this skirt! I am on a total leather kick lately, and this skirt is absolutely perfect. I’m green! Love the holiday weekend! SO much food though. Im scared to take photos for my blog hahaha! Love the leather skirt! I just scooped up a quilted high waisted leather skirt from crossroads! Hi darling! I just found your blog via My edit, and let me tell you I’m smitten by your looks! You’ll se much more of me around, happy holidays! You look amazing! So classic and yet edgy all at the same time! I seriously love all the pieces on ModeWalk. I’ve spent HOURS on there and plan on picking out a piece this weekend! the necklace is stunning and I need to get my hands on that skirt. omg I can’t believe you got that amazing skirt at the sale! EEp, so jealous. It looks amazing on you. Your outfits always look so sleek. that leather pencil skirt is stunning!! you can never go wrong with stella mccartney! DYING over that leather pencil skirt!!! You look so incredibly classy and chic in this outfit, Anh! Perfection. very classy, love the orange accessories! Enjoy that weather (and necklace!) before they’re gone! You look amazing, girl!! How I love that chunky necklace and the leather skirt!This outfit is so simple and well put together.The necklace adds so much to the look. Love your style, your elegance and your beauty!! Love your style and this look! Love the classic look paired w the statement necklace! You truly inspired me to begin my own lifestyle blog. Thank you so much Anh! Check me out if you have a free second. oh my goodness, you are killing me with all these leather looks! you look fabulous my dear! oh my heavens that necklace! l-o-v-e IT! Love this skirt! In fact love all the black leather pieces lately! So sophisticated yet a simple look. The skirt is gorgeous. Not bad at all! Love the holidays! I love this outfit! That statement necklace is gorgeous and your handbag is amazing and that skirt is FIERCE….oh I just love everything!!!! Perfection! That skirt is to-die-for! This whole outfit is close to iconic! 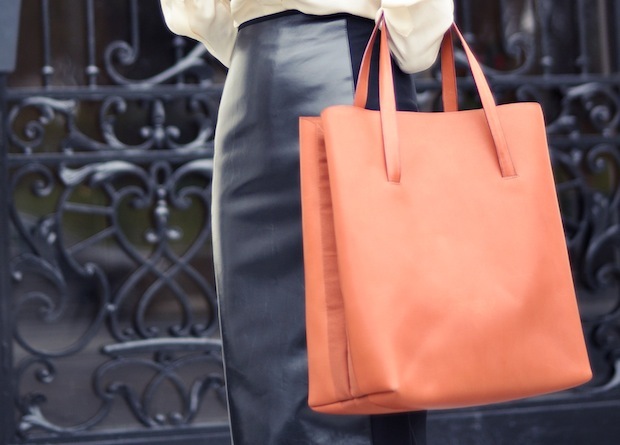 The pencil skirt, the tote … I love it. beaut outfit – the skirt is just beyond! That is a great necklace!!! I like the Kate Moss story! Fabulous outfit! Love the skirt. This look is great. That orange color is so vibrant. Love! This look is stunning…and that necklace, WOW!